﻿Cyathea dregei, syn. 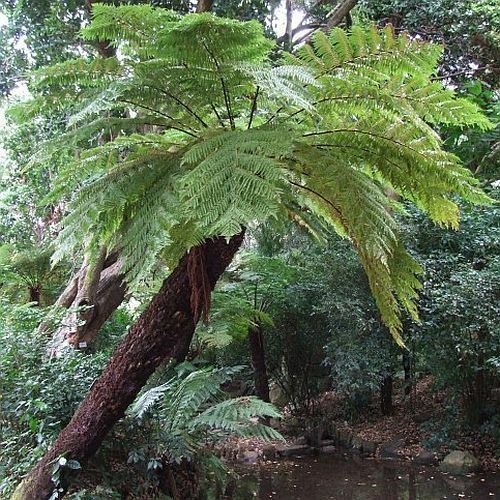 Cyathea angolensis, Cyathea burkei, Alsophila dregei, called Grassland Tree Fern or common tree fern is a rather large, stout-trunked tree fern from the forests and grasslands of South Africa. It is relatively frost-hardy. ﻿Please use for sowing of fern spores Jiffy 7 Peat Pellets, soak them in water and put in a plastic pot. Sow the fern spores on the peat pellets. Location: on the windowsill or in a small greenhouse in partial shade, daytime temperatures at about 77 F, somewhat lower at night at 68-72 F. The resulting micro-climate provides ideal conditions for germination. Soon you will see a fine green layer on the surface. From the prothallia the small fern plants will develop with high humidity.